Samsung has officially launched Galaxy S4 high-end android smartphone at last month with various new feature like smart pause and smart scroll (Check 12 unbelievable features of Galaxy S4). The Smart Pause and Smart Scroll allows you to control your devices with your eyes. Previously you cannot find this feature on any other smartphone. 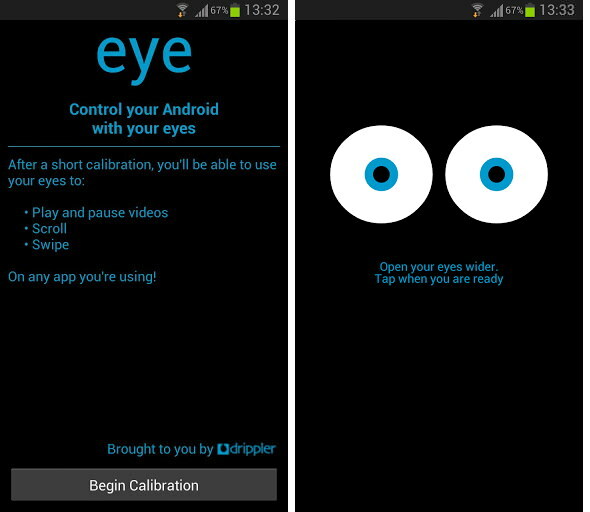 Drippler has launched new "eye" android application, that allows users to use Eye Control feature in all other Android devices with a front facing camera. So Eye Control feature not only for Galaxy S4, you can use it in other Android devices too. With eye app you will be able to pause and play videos, Scroll your smart phone screen and Swipe your phones with your Eyes without touching on the screen.